Renewing and furthering South Africa’s trade and investment relationship with California was the emphasis when Consul Talifhani Mbelengwa from the Consulate General of South Africa in Los Angeles stopped by the California Chamber of Commerce this week. The South African Consulate General in Los Angeles represents the 13 western states of the United States. South Africa has four consular offices in the United States, including the embassy in Washington, D.C.
Consul Mbelengwa’s September 26 visit was pleasant and informative as he discussed the current activities and goals of new South African President Cyril Ramaphosa, who was elected in February. President Ramaphosa led the South African delegation to participate this week in the United Nations General Assembly. On September 24, the day before the start of the General Debate, a statue of Nelson Mandela was unveiled during the Nelson Mandela Peace Summit to commemorate the centennial of Mandela’s birth. In President Ramaphosa’s inaugural address to the General Assembly, he spoke of his foreign policy goals and priorities, including fostering economic development, greater stability and transforming the South African economy. Also while in New York, President Ramaphosa met with CEOs from major global companies as part of a drive to attract foreign direct investment to foster economic development in South Africa. This is part of the build-up to South Africa’s International Investment Conference on October 26 and 27. The purpose of the conference is to begin an investment-drive program with the goal of bringing $100 billion of investment into the South African economy over the next five years. The centennial of Mandela’s birth, officially on July 18, has been a year-long celebration in South Africa. To honor Mandela, the national government, industries of South Africa, and the Nelson Mandela Foundation, among others, have hosted a number of events. The theme for the celebration is “be the legacy,” which serves as a reminder to stay true to Mandela’s ideals, including his unwavering commitment to justice, equality and a nonracial South Africa. California and the Western Cape Province of South Africa share a sister state connection dating back to 2000 when the California State Senate passed a resolution. The resolution describes the many geographic and cultural similarities between California and the province. The sister state resolution demonstrates the two regions’ commitment to the development of social, economic and cultural exchanges to strengthen economic ties and improve goodwill. South Africa is the 42nd largest export destination for the United States, with exports more than doubling over the last decade. In 2016, two-way trade between South Africa and the United States was approximately $12.75 billion. As South Africa’s second largest export partner, the United States exported $5 billion to South Africa in 2017. Non-electrical machinery accounted for 19.4% of exports, followed by transportation equipment (15.9%), chemicals (14.8%), and computer and electronic products (7.8%), which comprised the majority of South Africa’s total imports from the United States. In 2017, the United States imported $7.75 billion from South Africa, 47.5% of that being primary metals. The African Growth and Opportunity Act (AGOA), signed into law in May 2000, offers tangible incentives for African countries to continue efforts to open their economies and build free markets. The CalChamber believes that it is in the mutual economic interest of the United States and sub-Saharan Africa to promote stable and sustainable economic growth and development in sub-Saharan Africa and that this growth depends in large measure upon the development of a receptive environment for trade and investment. The CalChamber is supportive of the United States seeking to facilitate market-led economic growth in, and thereby the social and economic development of, the countries of sub-Saharan Africa. 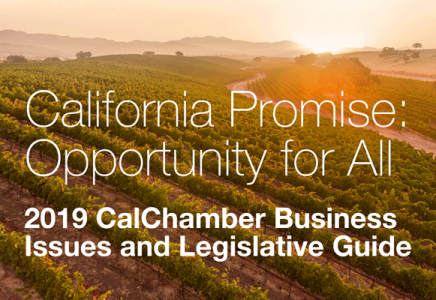 In particular, the CalChamber is supportive of the United States seeking to assist sub-Saharan African countries, and the private sector in those countries, to achieve economic self-reliance.